The following is the historical background and game instructions for a Flames of War linked campaign. The campaign focuses on the historical experience of the Feldherrnhalle formation of the German Army. The unit change designation, type and division assignment during the course of 1936 to 1945 in fact was almost entirely destroyed at several occasions. Nevertheless, it is just barely imaginable that a fictional officer could have followed the entire transition of the formation. All historical information is pulled from Wikipedia and other common references. 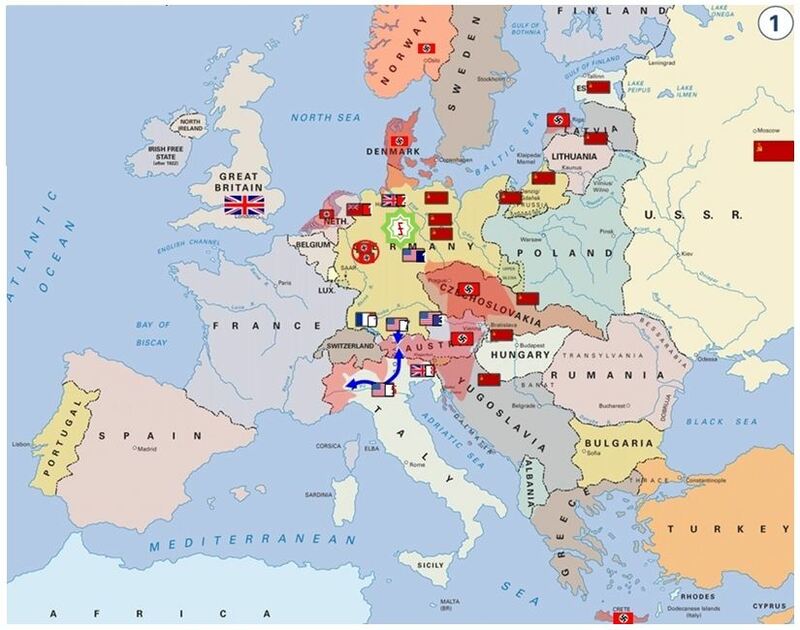 All maps are from an excellent animated power point slide deck showing a fast track version of the Second World War. I found it online and unfortunately do not know the author or origin. I have edited the slides to focus on the appropriate aspects for this campaign and remove all the other “activity indicators” for the rest of the war. All games use a fixed setup with the attacker listed on the left and the defender on the right, regardless of company type. The army lists are designed to be representative of the forces of the historical engagement and might not be the most effective combination. Erwin Schmidt served in the Feldherrnhalle Division and its ancestral units during the Second World War. This campaign chronicles his progression through the ranks of the division as well as the service history of the unit. Major strategic movements of Feldherrnhalle are indicated by the unit symbol in an eight-sided green star. The campaign is divided into five chapters which cover the major phases of operations for Feldherrnhalle. The tragedy and insanity of war cannot be highlighted more than by the fact that over half of the chapters end with the complete annihilation of the division. Erwin Schmidt joins the Sturmabteilung (SA) in Muenchen (Munich) in 1936 at the age of 18. He is initially stationed as part of the reinforced policy units in the newly opened Rheinland region. After the paramilitary functions of the NSDAP are taken over by the Schutzstaffel (SS), Erwin joins the SA-Standarte Feldherrnhalle and is placed on guard duty at the Muenchen (Munich) garrison. The Standarte is one of the first units to march into Austria during the March 1938 Anschluss and Erwin rises to the rank of Truppfuehrer (Sergeant). Back in Stuttgart, he volunteers to join Sonderverband Danzig, a new SA police unit with responsibility for the isolated Danzig sector. Under Generalmajor Friedrich Georg Eberhardt, Erwin Schmidt serves in Sonderverband Danzig. At the start of the invasion of Poland, the Sonderverband is tasked to occupy strategic locations in the city. Newly promoted Haupttruppfuehrer (First Sergeant) Schmidt is ordered to lead a strategic assault on the Danzig postal office. The battle uses special skirmish rules adapted from the Partisan & Polizei mini game. After the success in Poland, the Sonderverband is reformed into the 60. Infanterie-Division and receives enough rolling stock to operate fully motorized. Like many experienced SA NCOs, Erwin is commissioned to his new Wehrmacht rank of Leutnant. The new division received initial infantry training in Lothringen (Lorraine) but remains in the strategic reserve during the rapid conquest of France. Fully formed, the division is re-located to Romania in January 1941. In April the division kicks off Operation Marita but sees limited action in Serbia. In June 1941 the division joins Army Group South’s push into the Soviet Union as part of Operation Barbarossa. The initial assault into Soviet territory brings the 60. Infantrie-Division in contact with several Soviet Infantry (Strelkovy) divisions. Once through the Russian lines, the division advances on Rostov on the Don and conquers the city. Erwin is promoted to the rank of Oberleutnant. Despite the successful conquest, the division and all of Panzergruppe 1 is ordered to withdraw from Rostov and form defensive lines for the winter. Soviet assaults on the line continue through the winter of 1941-1942. The winter defence depleted the division but new equipment and reserves from the Western front replenish the unit in time to participate in Generaloberst Paulus’s 6. Armee drive to Stalingrad. The 60. Infantrie-Division is one of the leading units thrown into the defences of the city. Oberleutnant Schmidt receives serious wounds during the battle of the city and is send to Byelorussia for convalescence only two months before the 6. Armee is annihilated in the cauldron of Stalingrad. After recovery of his health, Erwin re-joins the remnants of the 60. Infanterie-Division in the south of France where the unit is reformed into Panzergrenadier-Division Feldherrnhalle. As one of the few surviving officers, Erwin is promoted to Hauptmann and receives command of his own Panzergrenadierkompanie. After refit in France, the division is finally assigned to Third Panzer Army and joins the fighting retreat near Vitebsk in Byelorussia. The division is tasked with defensive rear-guard actions along the entire northern line. In January 1944 several units of the division are tasked with the defence of the Vitebsk line. Despite the pressure on the Byelorussian front, the division is airlifted to the Narva front to defend the river crossings into Estonia. Erwin led his Kompanie during critical bridgehead counter-assaults including the large waves on February 15th to 28th, March 1st to 4th and March 6th to 24th. With the Narva river at least temporarily secured, the division receives orders to reinforce Army Group Centre near Mogilev and Orsha. The division arrives in May 1944 and forms the reserve of the Fourth Army under General Kurt von Tippelskirch. Weeks later the start of Operation Bagration places the full might of the Soviet Union against the depleted Army Group and the German lines crumble at Orsha. The rapid advance of the Soviet armies catches up with Panzergrenadier-Division Feldherrnhalle near Minsk and Erwin participates in several fighting withdrawals against heavy Soviet armour columns. As Army Group Centre collapses around them, Hauptmann Schmidt leads one of many smaller scale breakout attempts to reach eastern Prussia. With heavy losses his unit is one of the few who make it across the Weichsel (Vistula). The survivors of the collapsed Panzergrenadier-Division Feldherrnhalle are assigned to Warthelager and separated into several Feldherrnhalle formations. Wounds received during his escape across the Weichsel (Vistula) make it impossible for Erwin to serve in the new Panzergrenadier-Division Feldherrnhalle. Instead, in recognition for his service in the Feldherrnhalle ancestral units since the outbreak of hostilities, Erwin is assigned to the new 106. Panzer-Brigade Feldherrnhalle and assumes command of the V/Panzer Abteilung 2106 Feldherrnhalle. His direct superior is famous Panzer-Ace Oberst Dr. Franz Baeke. The brigade re-locates to Elsass-Lothringen (Alsace-Lorraine) to blunt the assaults of General Patton’s US Third Army in September 1944. The hastily assembled Panzer-Brigaden are thrown against the US forces in Alsace-Lorraine. Without adequate aerial surveillance, communication equipment and unit level training, the 106. Panzer-Brigade Feldherrnhalle penetrates deep into US lines only to find itself cut off from the main German push. After the massive defeat in the Lothringen (Lorraine) valley, the brigade regroups and withdrawn with the rest of the First Army behind the Rhein (Rhine). Short in tanks and equipment, the brigade (now with less than 20 active tanks) is shifted slowly north-east in continuous rear-guard action. In January 1945, Baeke is relieved of command for division training and a rapid succession of commanders replaces him during January to March. In early April 1945, Hauptmann Erwin Schmidt is in active command of the now nearly-combat ineffective 106. Panzer-Brigade Feldherrnhalle near the Harz Mountains during a final encounter with US armoured units. With the unconditional surrender of Germany, the 106. Panzer-Brigade Feldherrnhalle disbands on May 8th 1945 and individual survivors surrender to American forces. Acting commander Erwin Schmidt is incarcerated until 1947 and ultimately dies in a car accident in Frankfurt in 1978. Historical Note: The overall framework of this campaign is historical. In particular, the ancestral units of Feldherrnhalle and their deployment history are accurate. Individual battles are fictional creations but influenced by likely scenarios given the disposition of forces at the time. Erwin Schmidt is a fictional person and not based on any serving member of Feldherrnhalle. All other named personalities are historical figures and served in the given roles. After Oberst Dr. Franz Baeke was relieved of command of 106. Panzer-Brigade Feldherrnhalle, the unit went through rapid command changes due to battlefield casualties: Major Bernhard von Schkopp (Jan 12 – Jan 24), Oberstleutnant Heinrich Drewes (Jan 24 – Mar 29), Hauptmann Richard Pohl (Mar 29 – Apr 11) and finally Oberleutnant Ernst Matten (Apr 19 – May 8).